In early 1980, Dan Fraley, a Lower Southampton, Pennsylvania United States Marine veteran who served in Vietnam during the war, initiated a campaign to place a Vietnam Veterans Memorial in Bucks County to honor military service members who died or went “Missing In Action”. My curiosity led me to wonder if there were any female military personnel who might be part of the Bucks County Memorial. No Bucks County female would be on that list but I discovered there were eight military nurses who died in Vietnam during that war. It became my mission to find out who they were, where they lived, where they served and how they died. At that time I was married to a combat Veteran who had served in Vietnam during 1968. 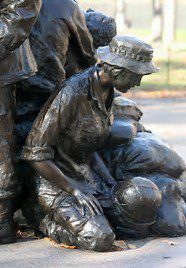 I became a voracious follower of any coverage of the war yet never recalled any news about women who served or died in Vietnam. Considering the unpopularity of the war, coverage of military women serving in-country rarely hit the news. My goal then was to honor these eight women with brief biographies in a book titled “There are eight of them …”. Interviews began with family, friends and veterans. But I bumped up against a wall after completing first drafts of three nurses. Women have been warriors in conflicts beginning with the Revolutionary War up through our present day. What disheartens me most are recent media reports describing the continued disrespect against women in uniform, much of it coming from their Brothers in Arms. Since WWI the role of women in uniform and their MOS (Military Occupational Specialty), limited them to tasks behind battle lines. When the MOS expanded with our Nation’s conflicts in Afghanistan and Iraq, opportunities for these women brought them close to or in some incidences, onto the battlefield. The Afghanistan-Iraq wars took 139 American women warriors who served their country. Six of those women warriors died while performing duties on the battlefield. 800 additional women warriors were wounded, many still struggling with physical and/or emotional injuries. During the Vietnam War, one statistic numbers 7,484 women as having served in-country. 6,250 of that total were in the Nurse Corps, a majority of them female nurses. The eight women I researched, all shared the common objective to join the military to serve their country. When I interviewed other women veterans, they too had clung to that motivation to Serve their country. U.S. Army Nurse Corps 2nd Lieutenant Carol Ann Drazba (December 11, 1945 – February 18, 1966). Home state Pennsylvania. Died in a helicopter crash outside of Saigon. U.S. Army Nurse Corps 2nd Lieutenant Elizabeth Ann Jones (September 12, 1943 – February 18, 1966. Home state South Carolina. Died in a helicopter crash outside of Saigon. U.S. Army Nurse Corps Captain Eleanor Grace Alexander (9 September 18, 1940 – November 30, 1967). Home state New Jersey. Died in airplane crash on TDY (Temporary Duty). 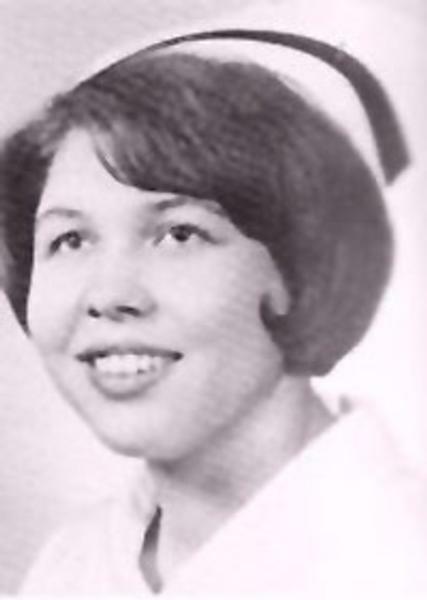 U.S. Army Nurse Corps 2nd Lieutenant Pamela Dorothy Donovan (March 25, 1942 – July 8, 1968). Became American citizen; Home state Massachusetts. Died from in-country illness. U.S. Army Nurse Corps Lieutenant Colonel Annie Ruth Graham (November 7, 1916 – August 14, 1968). Home state North Carolina, Colonel Graham served in 3 wars. Death was from natural causes. U.S. Army Nurse Corps 1st Lieutenant Sharon Ann Lane (July 7 1942 – June 8, 1965). Home state Ohio. Died from enemy attack on hospital. U.S. Air Force Nurse Captain Mary Therese Klinker (October 3, 1947 – April 9, 1975). Home state Indiana. Died in plane crash. I can’t leave this post before including women who’d served in Vietnam with the Red Cross and other civilian and religious capacities. Some still Missing. The Bucks County Vietnam Memorial was dedicated on June 16, 1984, now one of hundreds of other Vietnam WarMemorials that have been sited across America. This Memorial Day please remember to include in your thoughts the Women Warriors who gave their lives and those who continue to serve our country. This campaign statement uttered by candidate Donald Trump bragged that no matter what he did, his supporters would always stay with him. Yet some have begun to fall away. 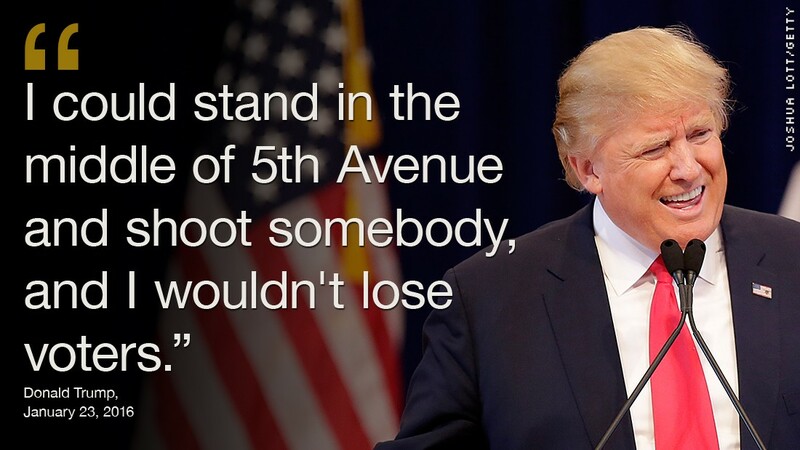 I keep hoping Congress will get the clue and impeach this foolish-erratic-childish person. It’s obscene how Trump supporters continue to cheer his decisions–from signing Executive Orders guaranteed to reverse environmental protections for Americans, to dismantling civil rights, to appointing Cabinet Members bent on ignoring their federal mandates, to hoarding his taxes, to including his family into powerful government positions, to disregarding the Emoluments Clause, to disrespecting the press and his inconsistent statements of support or rejection for any policy, or nation or leader. I’m a long-time political activist and one of millions of citizens who volunteered to elect Hillary Clinton. When, on October 28 2016, FBI Director James Comey notified the Senate Judiciary Committee about emails discovered on a laptop owned by Anthony Weiner–husband to Clinton Advisor Huma Abedin–it was a punch to my gut. Even if you liked or disliked Comey, Trump’s Tuesday, May 9, 2017 firing of him was a cold, calculated and humiliating action slapped on a dedicated public servant. While Trump chips away at our Constitution, legislators in Washington DC prefer to protect their butts. They’ve forgotten the purpose of the elected responsibility to their constituents. Trump’s week-end tax-payer travels to Florida or other sites disrupt citizens who live and work around his numerous cash cow properties. The funds expended could keep a small developing country out of the red. The Secret Service is also emptying our tax coffers for the 24-7 safety of Trump’s wife and child at his New York golden decorated Tower. Let’s keep hoping his wife and child will move into the White House this summer. They Are The First Family, They Should Be in Washington. Then there are the tax-payer funds for the Secret Service to protect Trump’s grown children, spouses and others each time they travel to places near and far around the globe promoting Daddy or their own Trump-connected products. My eyes hurt scrolling through numbers published by media outlets. The firing of Acting Attorney General Sally Yates along with the removal of U.S. Attorneys across America from their posts was an abhorrent action. The recall of senior State Department staff from their international stations has created a void of Good Will. The Wall. So obsessed is he about building this thing that would separate Americans from one of our friendliest neighbors. Russia. Putin. Hacking. And the shills who weaseled their way into his campaign. Be wise be woke be knowing. If Trump’s unbalanced behavior escalates, holes could turn our Constitution into a piece of lace. Our Fourth Estate–the Media–must continue their energy to surgically remove the infection crawling inside our Democracy.